After 25 years and 120 million miles of spaceflight, NASA's space shuttle Atlantis has flown its final planned mission with life as a museum exhibit ahead in its future. But the space plane is leaving an impressive legacy in its wake. Atlantis returned to Earth Wednesday with a smooth landing at NASA's Kennedy Space Center in Florida that capped a 12-day trek to the International Space Station. NASA is retiring the space shuttles this year, with just two more flights remaining after this one. "We're going to call it a mission. It was a lot of fun," Atlantis commander Kenneth Ham told Mission Control after landing. Just hours before landing, the lifetime odometer on Atlantis passed the 120 million-mile (194 million-km) mark after 32 missions ? a milestone that awed the shuttle's six-man crew. Ham said that it was "pretty darn awesome." Atlantis delivered a new Russian room along with some vital new batteries and spare parts to the International Space Station. It marked NASA's 132nd shuttle flight since 1981. "The legacy of Atlantis, now in the history books," Mission Control said. When Atlantis launched into space on May 14, it had already flown about 115.7 million miles (186 million km) during its 31 previous space missions. This mission, STS-132, is the shuttle's 32nd spaceflight and tacked on another 4.8 million miles (7.7 million km) to Atlantis' odometer. The total miles in space: 120,650,907 miles (194,168,813 km). During its trips to space, Atlantis has visited two space stations (the International Space Station and Russia's Mir space station) as well as the Hubble Space Telescope. Atlantis' landing in Florida marked the 75th shuttle landing in Florida and the 58th mission to land at the spaceport during daylight. As of this morning, Atlantis has orbited the Earth at least 186 times on this current mission. That seems like a lot, but in the shuttle's 31 earlier missions, it racked up 4,462 laps around its home planet. So with Atlantis' Wednesday landing, it has circled the planet 4,648 times. When visiting the space station, the shuttle flies 220 miles (354 km) above Earth. Atlantis flew a 12-day mission to the International Space Station, where its astronaut crew delivered a new Russian research module Rassvet, which means "Dawn" in Russian. They also performed three spacewalks to install a spare antenna and six fresh batteries for the station's solar arrays. Those 12 days add to the 282 days in space the shuttle spent during its first 31 missions, boosting the total to 294 days in space. That's more than 9 months in space over the last 25 years and 32 missions. According to NASA, Atlantis has flown more than 190 crewmembers into space during its 32 missions. However, some astronauts like mission specialists Michael Good and Piers Sellers on Atlantis' current flight, made several trips on the shuttle. NASA astronaut Jerry Ross, a veteran of seven spaceflights, flew on Atlantis five separate times, including his first and last missions. "Obviously, it is my favorite space shuttle," Ross said. While Atlantis' STS-132 mission is expected to be the shuttle's final mission, NASA still has some plans for the storied space plane. 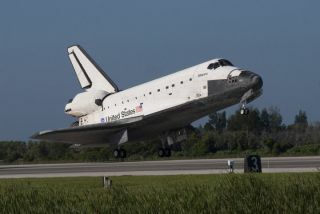 Atlantis will be prepared to serve as a rescue ship for NASA's final shuttle mission on Endeavour, which is currently scheduled for late November. If the rescue mission is not necessary, Atlantis would then head to a museum like its sister ships. NASA and some members of Congress and the Senate have been lobbying to turn that rescue mission into one extra shuttle flight, since the space agency has all the fuel tank and solid rocket boosters required for that potential mission. However, NASA would have to get approval from the White House ? which it has not yet received ? to add the extra mission for Atlantis. Shuttle program managers hope to get final word on the issue in the next month or so. If approved, Atlantis' extra flight could likely launch in June 2011 with a skeleton crew of four astronauts, shuttle officials have said. It would deliver hefty spare parts and supplies to the International Space Station, they added. "It is possible that we'll fly another flight on Atlantis," explained shuttle flight director Mike Sarafin earlier this week. "We'll just have to see how the budget and schedule plays out, given the direction that the agency has."